Fine Jewelry - Whether it is a beach glass bracelet, sea glass necklace or sea glass earrings, jewelry made with authentic sea glass has become very popular at all levels of our society. See photos and read interviews with our favorite sea glass jewelry artists. Signe Lawson ... of our SignetureX-clusive contemporary line of sea glass jewelry, contributes her unique combination of wire and bezeled jewelry as one of our featured artist. Living in the Great Lakes region of the United States, she became interested in turning her jewelry talents to sea glass after seeing a collection of beach glass that friends had gotten from the lakes. ... of linje designs, specializes in wire-wrapped jewelry. Her jewelry has been displayed in galleries on the East and West Coasts of the United States, and she has made custom sea glass jewelry for customers as far away as Peru and Japan. She also works with bezeled and PMC silver settings. 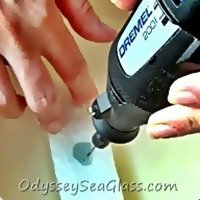 Lin is a main force behind Odyssey Sea Glass. Read her bio at "About Us." 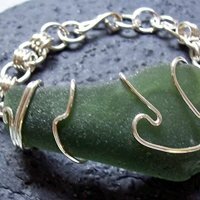 ... is the United Kingdom's favorite sea glass jewelry crafter of sea glass. In her jewelry, Joan incorporates the widest variety of rare glass collected from the nearby ocean shores. Joan has recently been chosen to supply 5 museums and art galleys across the northeast of England. Due to these new commitments, Joan will not be offering her jewelry here on Odyssey any longer. We have enjoyed working with Joan and give her our best in her ongoing sea glass jewelry success! 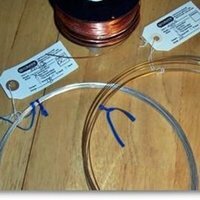 Have you ever wondered what other "found" items can be used to create beautiful and original unique jewelry? 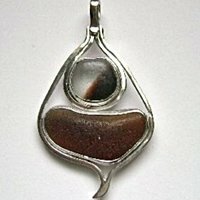 It is interesting to note that, on the other side of the world from us folks who live in the Americas, artists exploring dry creek beds or wandering tropical beaches gather seaglass, gold nuggets and Australian gemstones, such as blue sapphires and black opals, from which to create distinctively Australian jewelry. What more to ask for then a cool early morning walk on the beach? Or a stroll along the sand in the moonlight? The sights, smells, and sounds floating through the air on a soft sea breeze refresh the mind and body. 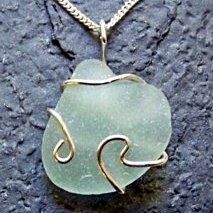 Jewelry made of sea glass also makes an excellent gift with a personal touch (especially if it's a gift from your husband or special person)! 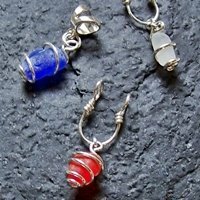 Lin's original wire wrapped seaglass jewelry is the perfect way to share or bring back those beach moments. Or perhaps you'd rather choose the refreshing contemporary look of Signe's special bezeled jewelry. For jewelry that is environmentally friendly,one of a kind, and beautiful, you have come to the right place! 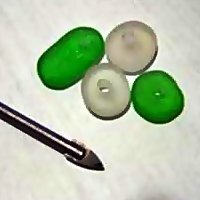 Check back frequently as more bracelets, pendants, earrings, and other sea glass jewelry and accessories are being made up continually by Lin, Signe, Joan, and other featured sea glass artists. Feel free to contact Lin if you have any questions about jewelry. What is the difference between naturally-tumbled and man-made sea glass? Why is this important? 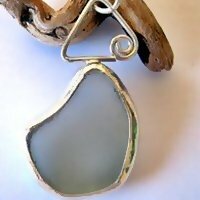 Genuine sea glass is used in all beach glass jewelry.